To make the world’s biggest passenger airliner successfully indoors you’re going to need the biggest building you can get. Boeing has just celebrated the grand opening of its new 777X Composite Wing Center (CWC) in Everett, Washington, in what is the largest building in the world. The construction facility spans across 1.2 million square feet, which is the equivalent to about 24 football fields. The facility, located on the north side of the main final assembly building, will manufacture the world's largest composite wings for the 777X, Boeing’s newest commercial jetliner. Construction of the new CWC building, which broke ground in 2014, required approximately 4.2 million hours of construction time. At its peak, 1,700 contract employees worked on the project. By the numbers, the new building required:-31,000 tons of steel with the highest beams weighing 720 pounds (326.587 kilograms) per foot. -480 miles of electrical cable. -80,000 linear feet of process piping. -170,000 cubic yards of concrete were poured. The concrete was brought to the site by more than 16,500 truckload deliveries. -The CWC is more than 27 acres under one roof – the equivalent to 24 football fields. -The building will contain three of the world's largest autoclaves – each big enough to fit two Boeing 737 fuselages inside. Aerial view of Boeing's new CWC facility. [/caption]The three large autoclaves, or pressurised ovens, are for curing the jet’s carbon-composite wings. The autoclaves are 120 feet (37 metres) long and 28 feet (9 metres) in diameter and weigh more than one million pounds (453,600 kg) each, large enough to hold two 737 fuselages, according to Boeing. 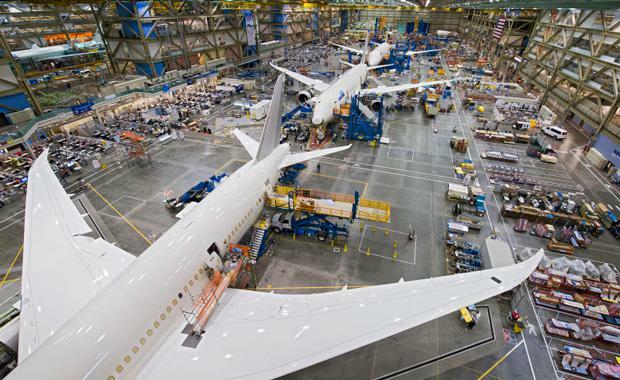 Boeing is building the Boeing 777-8 and 777-9 aircraft which are variants of existing 777 models designed to compete with Airbus, and in particular its A380 and A350 models, in the long range aviation stakes. Currently the world’s longest passenger plane is Boeing’s own 747-8 model at 76.3 metres, which will be eclipsed by the 777-9 and carry a maximum of 425 passengers.